IT rapidly adopted system virtualization because it enabled scalability, flexibility, mobility, resilience and the use of public or private cloud computing. A global file system provides these benefits for file data. A global file system unbinds file data from its underlying hardware like system virtualization separates the concept of a machine from physical hardware. File data is no longer tied to a physical box, so the data can be where it needs to be, without replicating physical copies and without conflict since there is only one source of the data. 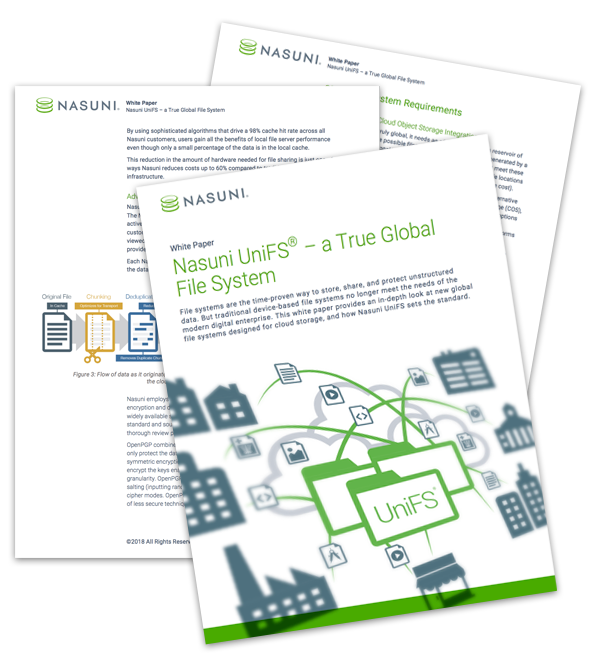 Learn how UniFS®, the world’s only truly Global File System, delivers on the promise of unlimited scalability, local performance, consolidated storage with central management, global access for collaboration, automatic, built-in protection and much lower file data storage costs. Get Instant Access by Submitting the Form Below!